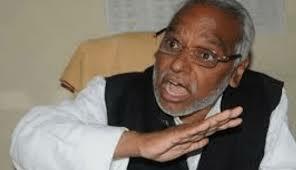 Leader Mahato says present govt alone able to amend constitution - Integration Through Media ....! SAPTARI: Rastriya Janata Party (RJP) leader Rajendra Mahato has stated that the incumbent government that is formed after the two-thirds majority could consider amendment in the new constitution. Speaking at a press meet held at Rajbiraj of Siraha district today, leader Mahato stressed the need for revising the national statute taking into consideration the sentiments of the Madhesh-movement. Mahato shared that his party would submit a memorandum to the respective District Administration Offices and the Office of Prime Minister on coming Monday on the same matter. The former Minister said that the government should be responsible for constitution amendment, holding swearing-in ceremony for lawmaker Resham Chaudhary, revoking the cases of those RJP cadres detained and alleged for false charges. He was of the view that ‘although the activities of the provincial government of province no 2 was not satisfactory’, the alliance between the Federal Socialist Forum Nepal and RJP should be further continued in respect of the public mandate. According to him, the alliance between the Federal Socialist Forum Nepal and RJP would be further consolidated.